"Creek Hill Custom Homes built us a beautiful home! They are wonderful to work with, always available for questions, and ready to provide guidance, they really took the stress out of building a custom home. More importantly they are always there to answer questions and respond to our needs after the closing date. Thank you to Mike, Barb, Betsy, David, and Tom!" "For several years, my wife and I had dreamed of building a new home that would be a great place for our children to grow-up in, while giving us enough space to entertain our family and friends. When we felt the time was right, we spent a considerable amount of time researching home builders in order to find the best builder for our dream home. We spoke with realtors and homeowners, and visited many houses during the annual Parade of Homes. With the feedback that we received, it was very easy to choose Mike Hillesheim and Creek Hill Custom Homes. From the first time that we met with Mike, we knew that we found the right builder. Mike was willing to listen to our needs and offered suggestions when we needed them. We had found a floor plan that we fell in love with and Mike worked with us to customize it to add our own personal touch to our home. A lot of people told us that building a home is not fun, while this couldn’t be further from the truth when working with Mike and his staff. They truly made our home-building process such an enjoyable experience. Mike’s staff was absolutely great to work with. They were so prompt in answering any questions that we had. The subcontractors that he uses are all first class individuals and tradesmen. We could tell that Mike has great relationships with them. Everything went smoothly through the building process and Mike made sure that we were able to move into our new home on time, while ensuring that our house was built to his extremely high standards. 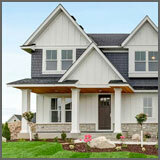 Creek Hill Custom Homes truly is a first-class operation. We are so delighted with our new home and neighborhood. We would definitely recommend Mike and his team at Creek Hill Custom Homes to anyone looking to build a great home." "Having a custom floor plan that met the needs of our growing family was our main focus when we chose Creek Hill as our home builder. The design team helped us realize our vision every step of the way, creating a great layout and maximizing our gorgeous pond views. The workmanship and finishes are the highest quality and really give it the custom feel we were looking for. Now that we’re living in the space, we couldn’t be happier!" "We had a great experience throughout the whole design and building process with Creek Hill Custom Homes. From the initial meeting, we felt very comfortable with Mike and his staff - they took care of all of our needs. Erik Myhran was very personable, easy to work with, and spent time getting to know us so he understood what our needs were in a new home. He even sketched our main level! Barb is the glue that keeps everything organized and on schedule - amazing! She kept us informed on the progress and next steps. We were impressed with the professionalism and attention to detail that all of the contractors gave us. When a problem came up, it was addressed immediately. Building a house can be a very stressful experience, but Creek Hill made us feel taken care of and helped make it stress free. Thank you Creek Hill and staff for building our dream home! We appreciate the top notch quality and attention to detail! We recommend Creek Hill Custom Homes to anyone looking to build a new home and would be willing to talk to anyone who has questions."